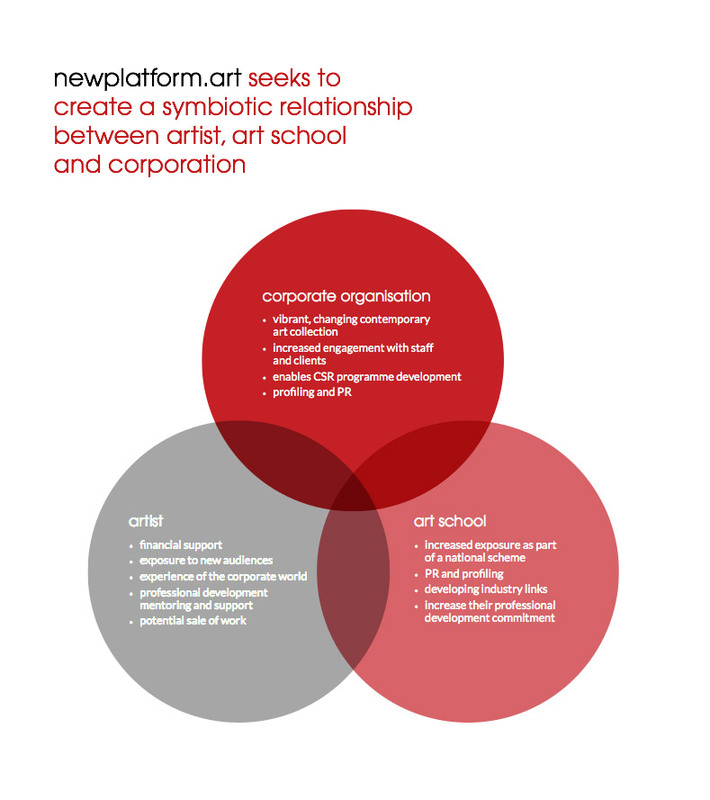 newplatform.art through its charitable activities and trading company, creates a symbiotic relationship between artist, art school and commercial organisation. The charity provides grants and education and is working to develop capacity for economically disadvantaged artists, which will increase social mobility. The trading company works with the artists to explore opportunities to develop their careers. Newplatform.art manages this three-way relationship to result in tangible outcomes and life-changing legacies. exposed to new audiences and gain an understanding of the corporate sector thereby experiencing new potential markets. increase and showcase tangible professional development commitments. newplatform.art provides commercial organisations with a dynamic, changing art collection, without the responsibility of ownership of a permanent collection, and a sustainable CSR programme which engages staff and clients. newplatform.art provides the structure, support and logistics to enable commercial organisations to display, support and engage. The flexibility of the model means that it can be adapted according to the needs and resources of the organisation, so that each can run their own custom-built contemporary art programme. The umbrella structure of newplatform.art allows participants to benefit from shared costs, making this a very cost effective option. This scheme gives the staff of the organisation a unique opportunity to engage with the visual arts and play a role in supporting the professional development of emerging artists. This represents CSR at its very best. newplatform.art will also run an internship programme for graduating curators to give vital project experience to this under resourced sector. Having a curator as part of the newplatform.art programme will ensure that the participating business display artwork to gallery standards. Each curator will be supported by industry experts. As part of the experience, the curator will practice a number of key skills including; placement of selected art works, project management and coordination, communication skills, budget management, organising and giving art tours, event planning and public relations.